The Chief John Ross Chapter, TSDAR, has recognized Bobbie Standifer, program coordinator for Operation Song Chattanooga, with the DAR Service to Veterans award. The award honors Ms. Standifer, "a local leader on a mission to improve the lives of area veterans and their families through music and special programs," coordinated by Operation Song Chattanooga. 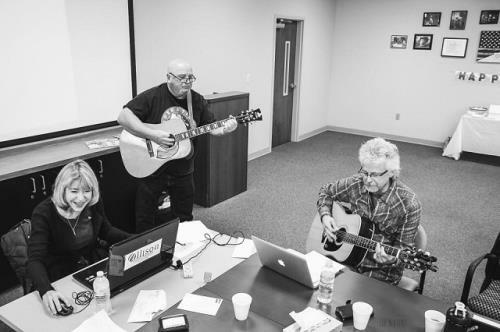 "Operation Song Chattanooga, a 501(c)(3) non-profit organization, helps empower veterans and active duty military to tell their stories through the process of songwriting in creative and therapeutic settings," officials said. "Founded in Nashville in 2012, the program pairs professional songwriters with veterans, active military and their families to help them tell their stories through song. They hold weekly workshops in Tennessee and sponsor events and group retreats throughout the U. S. Operation Song participants do not need a musical background, only the desire to tell their story. "In a typical session, the partner songwriter listens and encourages the veteran to lay out the 'pieces' of his or her experience in the military. Together, they arrange those pieces into verses and choruses, resulting is a complete song that the veteran 'owns.' Transferring difficult memories into song often aids the veteran in recovery or the family member to deal with tragic loss." "If veterans or a member of a veteran’s family are interested in joining Operation Song Chattanooga, email operationsongchatt@epbfi.com. If you are interested in working with service to veterans, educational programs or historic preservation and conservation and you are female, contact localhistorycounts@gmail.com. Our membership team will assist you in preparing your DAR application," officials said.